Andre Hahn has hit the ground running since returning to hometown club Hamburg, seven years after being released by HSV. 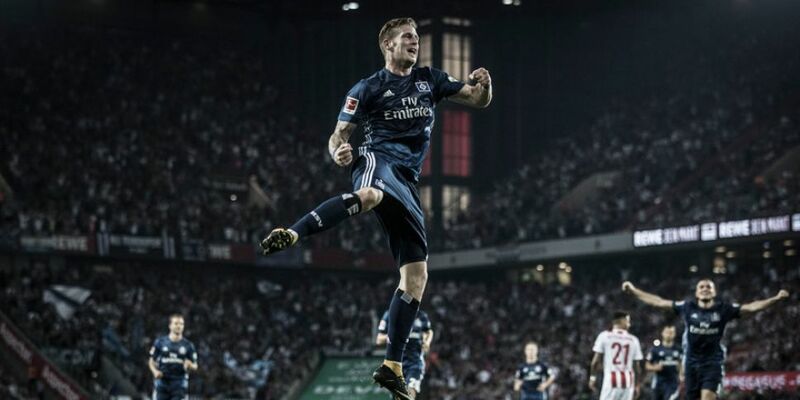 Hamburg went top of the Bundesliga – for 24 hours at least – after beating Cologne 3-1 at the RheinEnergieStadion on Friday. Andre Hahn scored the goal of the game, and thinks the perfect six points from a possible six is just a sign of things to come for HSV. Question: Andre Hahn, how did it feel to score your first Hamburg goal? Andre Hahn: It hasn’t really sunk in yet. I’m delighted to score my first goal in our second game, and that we’re top! I like to do well but the team comes first. Question: Can you describe your goal a bit? Hahn: We often have these situations in training. It may sound stupid, but the deliveries that are the most awkward are often the best. We’ve practised this path to goal many times in training. I saw the ball coming, hit it perfectly, and it felt good immediately. Question: Was this the perfect game for Hamburg? Hahn: Yes! It’s exactly what you’d want from a Friday night! You have to take your hat off to us that we delivered such a result away in Cologne. Now is the time for positive headlines. We need to maintain our level over the international break. We have a good feeling. We have proven our character and mentality. It’s a big compliment to the team. Question: How have HSV managed to start the season with two victories? How does the squad deal with this? Hahn: We're going to take a cold shower! None of us would have expected it. Many had already written us off after the Osnabrück game [Hamburg were beaten 3-1 by the third tier side in the DFB Cup two weeks ago]. Now we are top of the table with six points after two games. It doesn’t get any better. We all know that this is just a snapshot, though, and we have to work hard for our points. I’m very optimistic. Watch: Bobby Wood delighted to be back among the goals! Question: Did the cup defeat unite the team? Hahn: Yes, we knew we hadn’t played well and we were rightly criticised. We were hard on ourselves and it seems to have paid off, though. We moved forward together as a team. Everyone works hard for everyone else, like Bobby Wood, who takes my position when I’m right up front. This will be important for the coming season. Question: You are just getting to know your new teammates. In recent years Hamburg have been fighting relegation. Are you surprised with this positive start? Hahn: I imagined it could be like this. We all know that HSV has a lot of potential. When you get into a good run and you have the fans and the city behind you, then it’s easier for everyone. It also makes football fun again. We’re now approaching our upcoming games with confidence because we know we can win. I want to play my part.